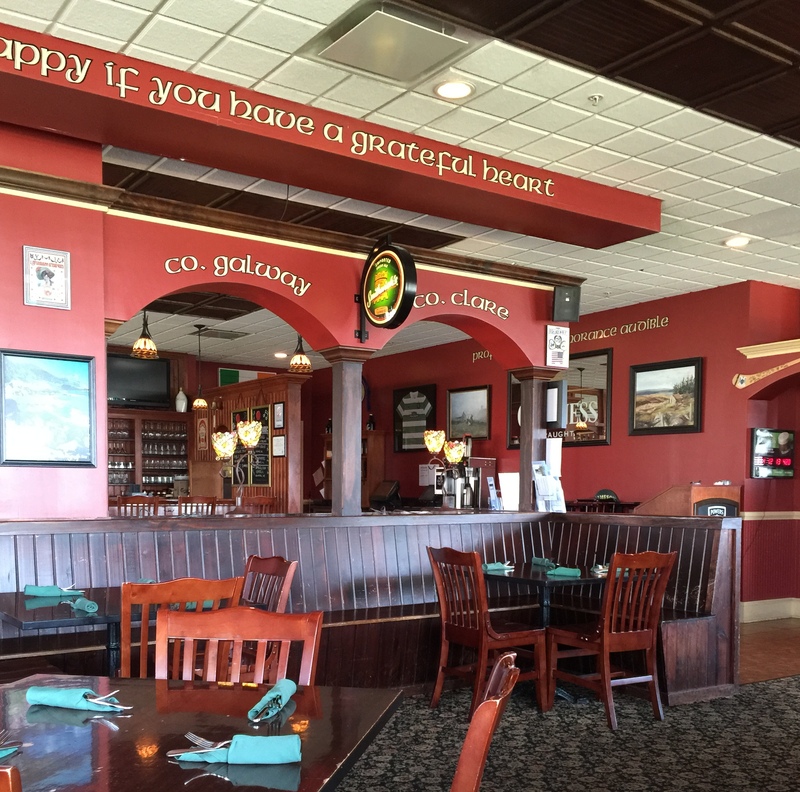 The Best (so far) Reuben we ate in SE Wisconsin was…. Our Take Three Tuesday task this week was to try reubens suggested by our Facebook page members. 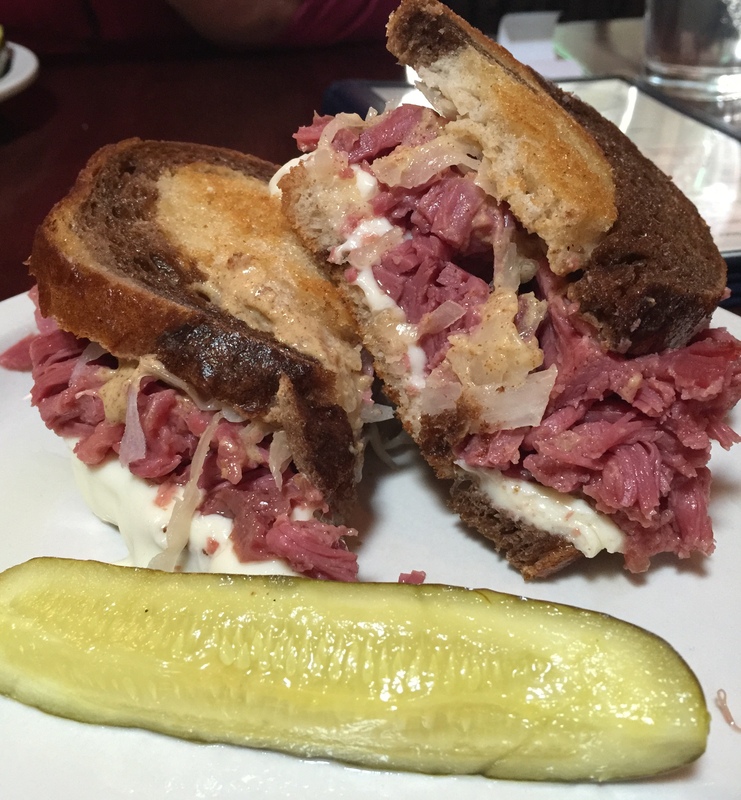 There was a clear favorite with one of the Milwaukee places making corned beef and reubens that folks travel from Chicago to sample. Surprisingly, this was not our winner. McBob’s has a load of fans as well as well-documented critical acclaim for their corned beef and their reuben. 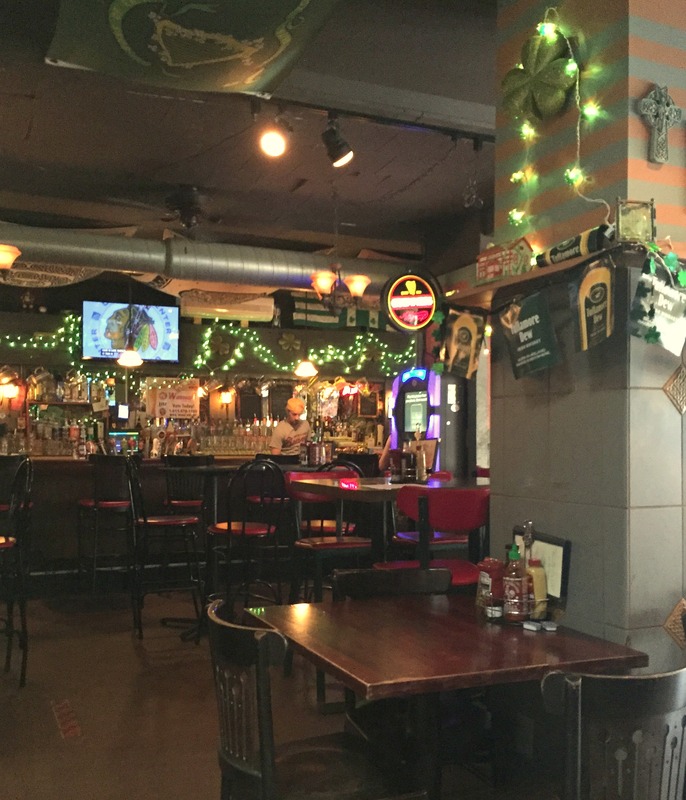 A sign indicated that they offered Brewer’s bus trips and the interior was kind of Irish /sports bar but the drinks were a step above the average sports bar, with Moscow mules and jalapeno margaritas as well as an large craft beer menu. The friendly wait staff seemed like the type of guys you would want to watch a Packer game with on Sunday. We went during the day and although it definitely was a bar atmosphere, a few kids were there with their parents, so I think daytime would be fine. As far as the reuben goes, there was one problem – the tender, melt-in-your-mouth corned beef was beyond salty. Given the love for McBob’s, I can only suspect that we were unlucky and got an oversalted batch of corned beef. If it was not for the salt level, this sandwich would have been the winner. Here’s why: The cheese was deliciously melted and thick. Instead of thousand island dressing, McBob’s uses a horseradish mustard. I was skeptical, but after tasting, I think it was the best of the sauces. The marble rye was generously buttered and toasted to perfection, and the sandwich wasn’t overloaded with sauerkraut. The reuben came with chips and a pickle. Ashling on the Lough is a beautiful Irish restaurant on the harbor in Kenosha. Because it is only open for lunch on Fridays, you will probably end up getting there for dinner. Ashling is unique in that it offers three types of reubens: The Wisconsin (swiss cheese and sauerkraut), The Irish (Provolone and coleslaw) and the Rachel (turkey instead of corned beef). Each was $9.95 and came with your choice of Steak fries, Sweet Potato Fries, French Fries or Whipped Potatoes. 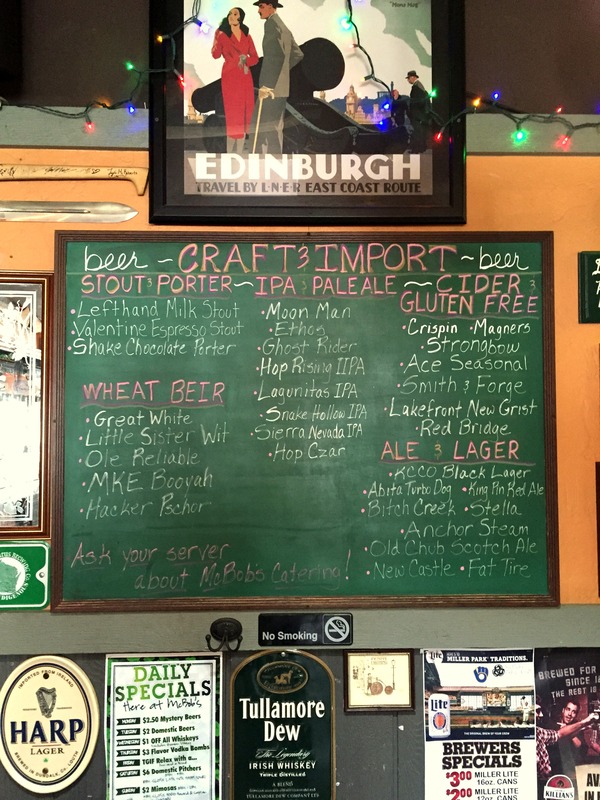 We ordered the Irish and the Wisconsin. Each came with the traditional thousand island dressing and marble rye. My dining partner thought this was the best reuben she had ever tasted. I thought it was good and clearly a lot of care was taken with the corned beef. However, the meat had a lot of pickling spice flavor which is traditionally used in making corned beef. I like a less aggressive pickling spice taste as a personal preference. Additionally, I thought the bread could have used a little more butter to get that extra-buttery toasted exterior. The sweet potato fries pictured were great. 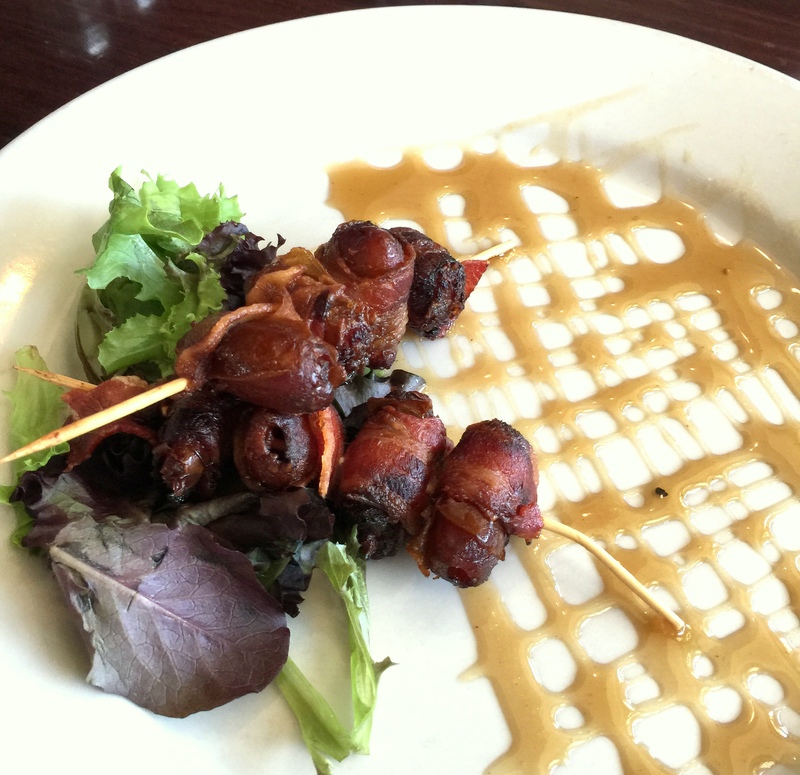 We tried out an appetizer-Bacon Wrapped Dates. The menu describes bacon-wrapped dates with a maple dijon sauce. Unique and delicious and beautifully-plated app which we finished very quickly. 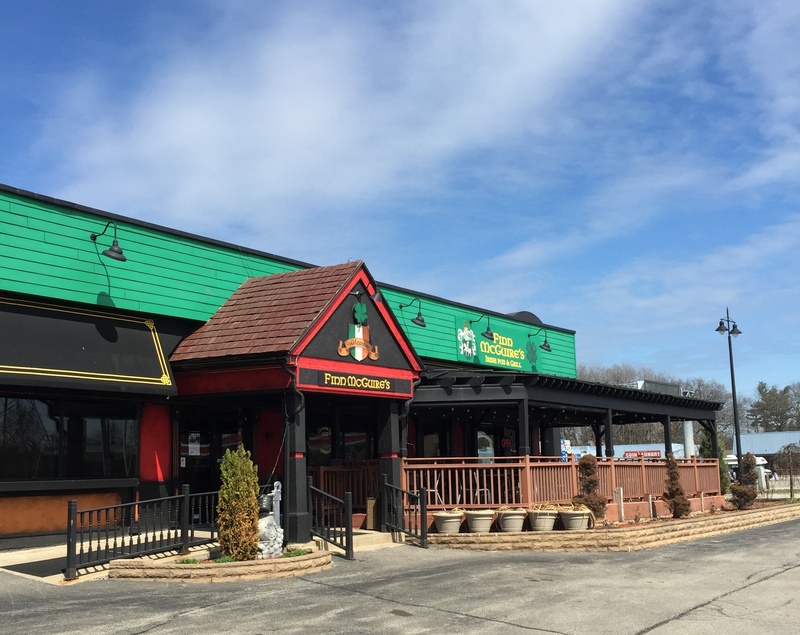 This is a clearly visible Irish restaurant/pub on busy Hwy 100 in Hales Corners. 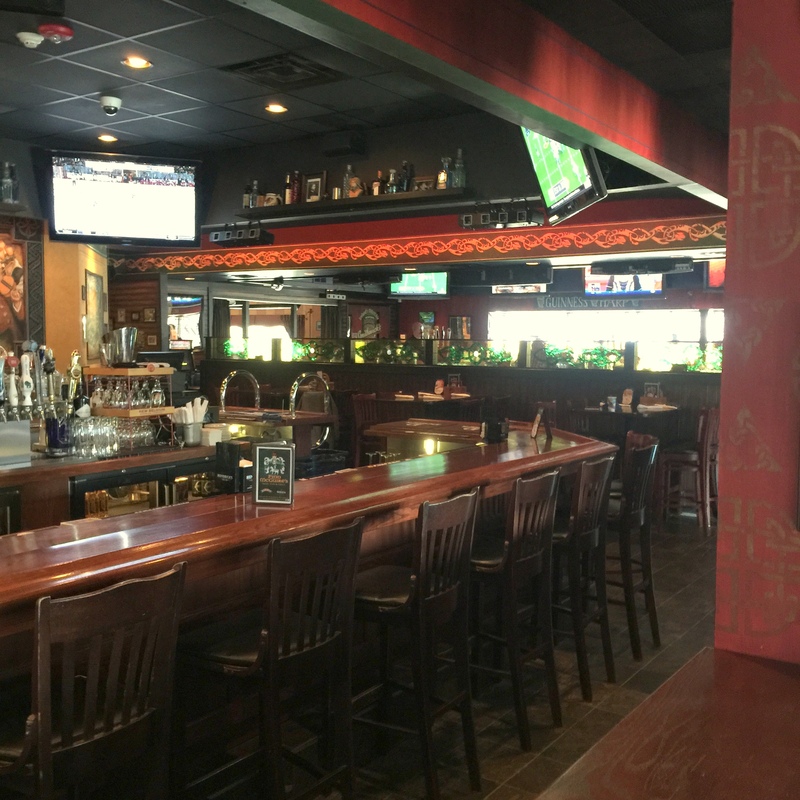 The interior was well-decorated with a lot of TVs and a couple bars. I could see this being a great Packer game hangout. 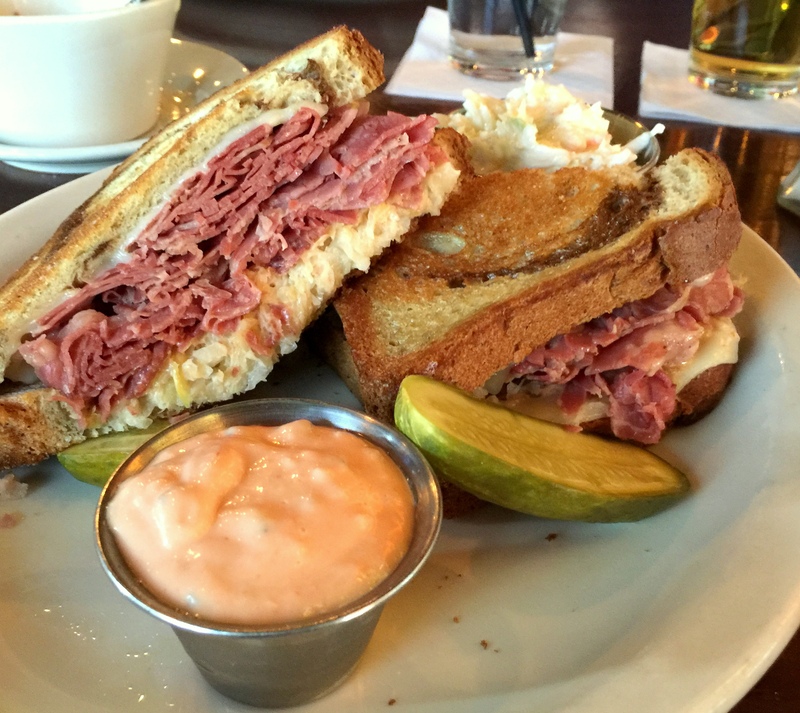 Finn McGuire’s makes a good-tasting reuben for $11.99. The corned beef probably was not the quality of the other two, but it had no distracting flavors (salty or pickling spice) This was shaved corned beef whereas the other two were more like pot-roast slow-cooked style. The marble rye was grilled to buttery perfection and the meat to sauerkraut ratio was right on. The thousand island dressing came on the side. I think I would prefer some directly on the sandwich along with some on the side as it is hard to dip in the dressing. 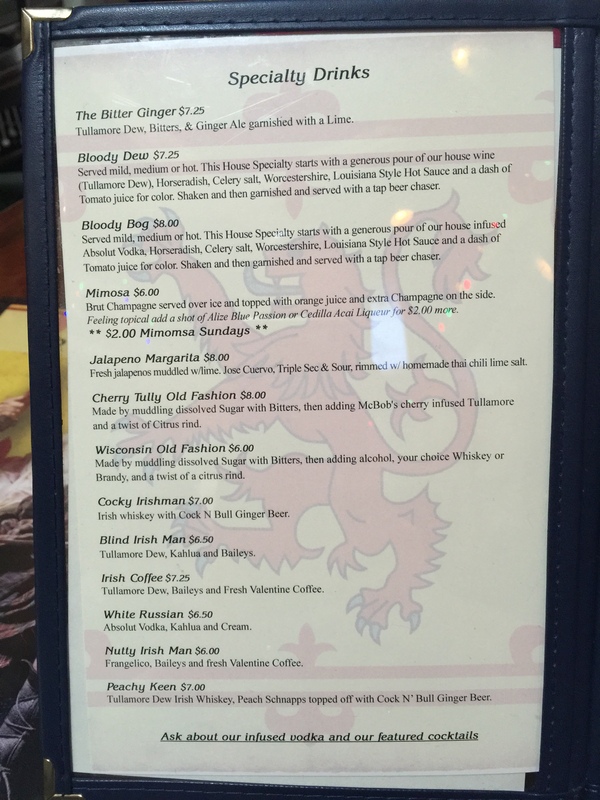 Also, I think Finn McGuire’s could kick it up a notch by making their own thousand island and putting a little spin on with horseradish or hot peppers. Also, I will mention that my side of coleslaw was top notch. 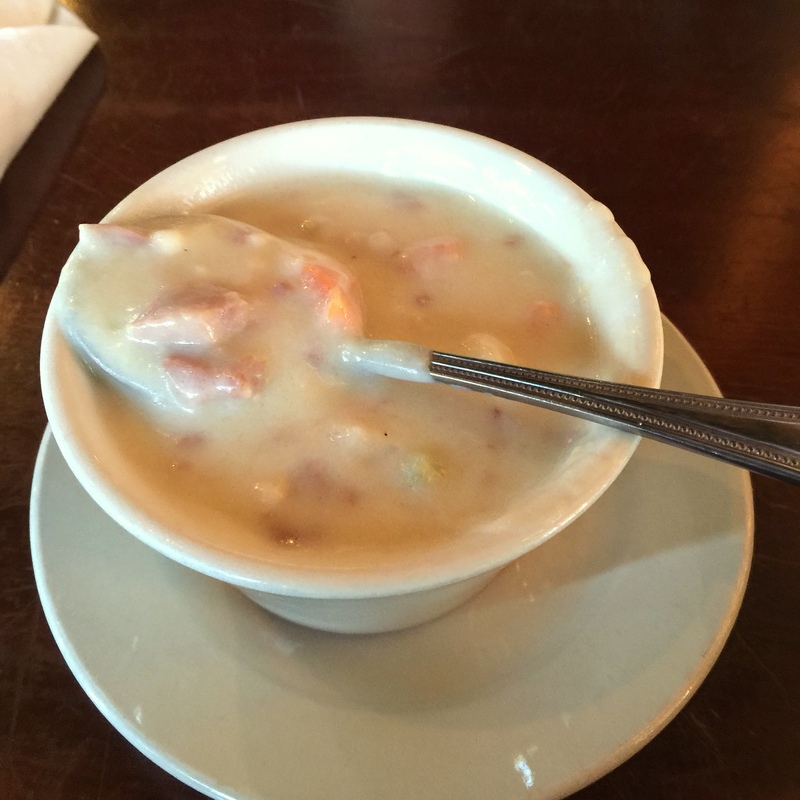 Finn’s also offered a Reuben soup – we cannot recommend it. It was bland with no flavor. 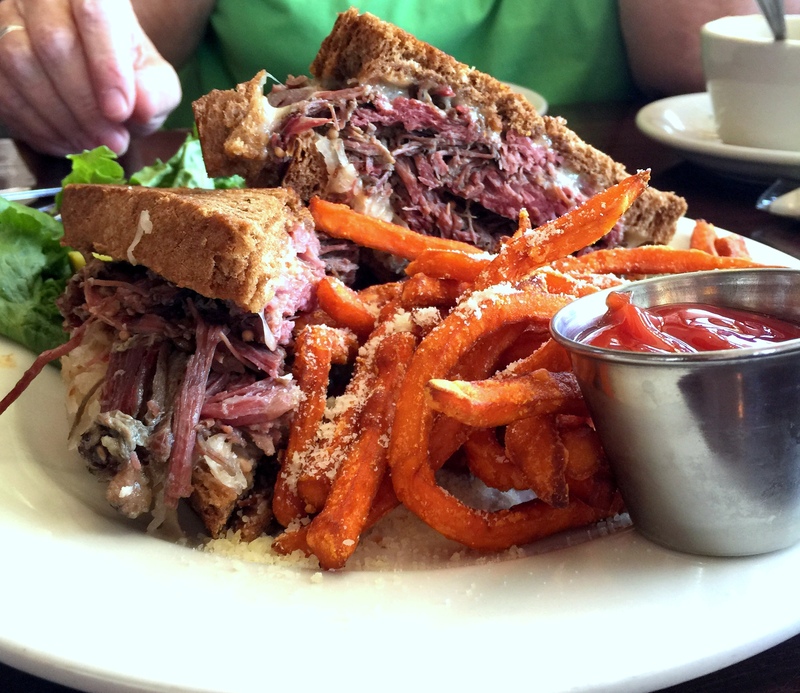 I love reubens, and the three we tried definitely were above average, but the search for the all-around perfect reuben in SE Wisconsin is still on. Until next time…. You don’t like the pickled added flavor in the corned beef but then you think adding horseradish to the dressing is a good idea? Ridiculous.